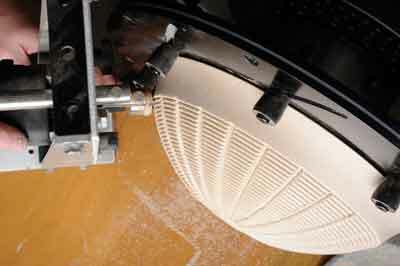 Cutting even depth router cuts on curved surfaces is not as difficult as one might assume. Once again, we will look at using the homemade version and also a ready-made manufactured vertical router holder and fluting jig seen in the previous parts of this series. 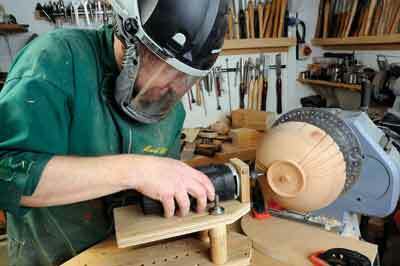 Fluting of any sort requires that the work be held in such a way that it is stable while you cut it. This can be on a faceplate, screw chuck, in a chuck or, as with previous articles, between centres. Some fluting requires that the work can be indexed off so you can work at a set or given number of positions to enable a cut to be made in a specific place. Indexing helps with this issue no end. 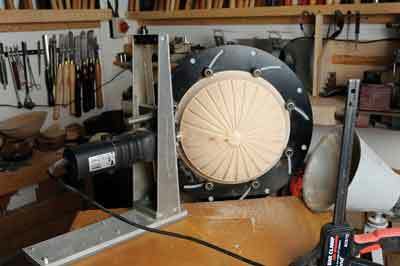 If you are working on a project that can be done in one go and not worry about any movement in the wood later, you can initially mount the work on a faceplate, screw chuck or similar to start with. After which, you turn the outside, then rout that outside surface after that, so you can then reverse the piece, hold it in a chuck and then turn the inside. 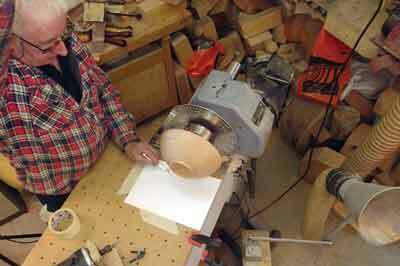 If, however, you are working rough turns where you have rough-shaped the inside and outside already and want to shape the outside, you will likely have to use a between centre holding method to refine the outside shape and top edge first. Then you can, depending on the routing required, either leave it between centres while you rout it, or, mount it in something like this Longworth chuck - or similar holding device - so you can work unrestricted on the outside face, before remounting in the chuck to refine the outside. 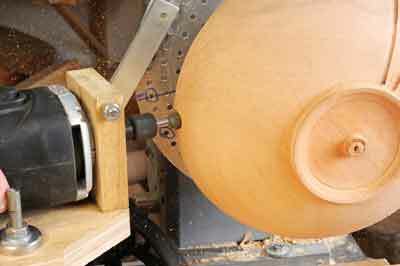 Later on, you will see a completely turned bowl held in the Longworth chuck so only the decoration is left to sort out prior to sanding the outside. 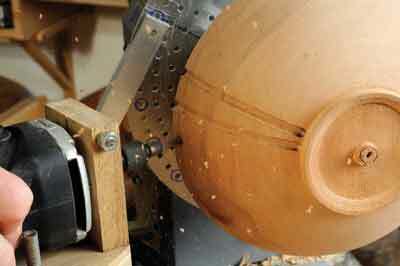 When using a homemade jig or, in some cases with ready-made ones too, you are going to have to work out a way of mimicking the curvature of the bowl. In other words, make a follow template or guide to suit the shape being routed; this will allow you to follow the exact form of the item you are working on. One way of doing this is to have a light source directly above the held work - in this case, the work held on a screw chuck - and have a piece of paper underneath it sitting on the baseboard used for the router. The light source needs to be exactly central and perpendicular above the work and you should end up with a shadow, which echoes the shape of the work, on the paper. You can then draw around this shadow, cut out the shape drawn and then lay this on top of a suitable piece of thick ply or MDF before cutting the shape to match the paper template. Next, you need to clamp it in place so that the front end of the fluting jig base touches the follow template all the way round. Yes, you will have to adjust the position by putting the fluting jig with router and cutter in place up against the template and adjust the position of the template until the router cutter just touches the surface of the work, all the way round. When you are happy that you have the right position to create an even depth of cut all the way round the work, then clamp the follow template in place. 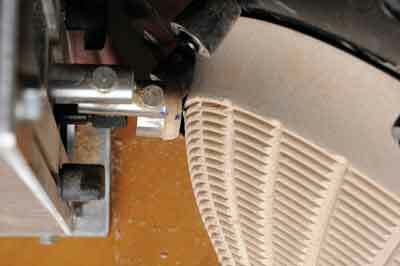 The next step is to adjust the cutter to give you the required depth. 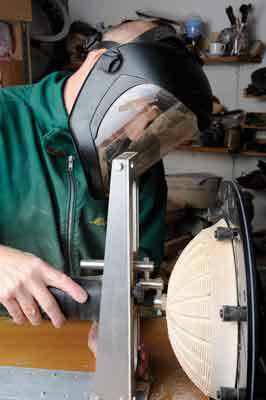 Make sure you have indexed off the work, or held in the right position, then start at the point on the work you need to and then run the router round, maintaining contact with the follow template and pressure downwards on the fluting jig to keep it stable until you reach the other end of the flute being cut. You can clamp or glue blocks at either end of the required travel range to give you a definitive start and stop position. Likewise, you can freehand or 'wing it', but freehanding can lead to cutting too short or overshooting the cut position required. 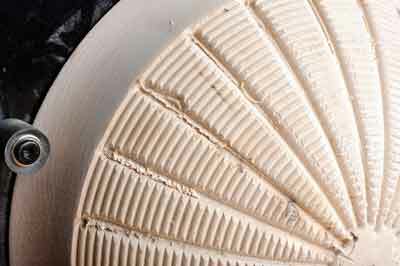 It doesn't really matter what cutter shape you use as long as it is the shape you need and of a size that is correct for the router. You might find that you need to make multiple passes if you need to go deep. Also, keep the router moving or you might burn the surface during the cut. 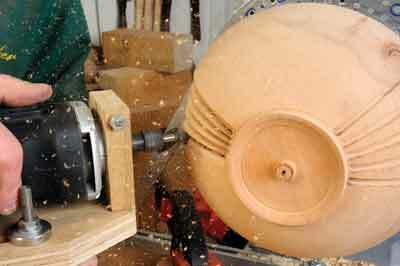 You can see two types of flutes cut on this bowl: the one being cut now requires three passes to get it to depth. Note the stopping short of the outer foot area. Any minor adjustments and cleaning up can be done later. It should be noted that the cutter does not have any safety shielding or guidance at the tip, unlike the ready-made example. 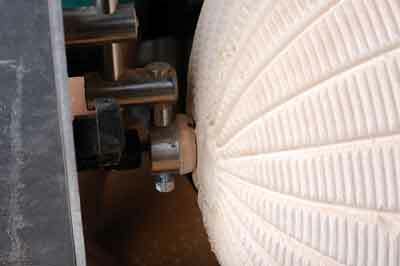 This unit has a protective device or overshield on the cutter - not all shop-bought units have this, so you might need to use the follow template method described earlier. 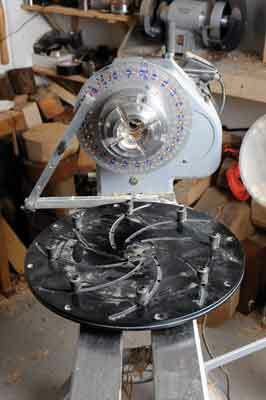 Here, it has a metal retaining ring, into which can be screwed in place home-made wooden or plastic collars of a diameter that slides over the cutter being used, as long as the cutter is not too large. You can turn the outside of the collar of a size to fit the ring and then drill the inner hole to suit the cutter head size. You can see that head in place here and the cutter just poking out of the end of the shield. This shield can also act as a depth cut limiter, as long as it is always in contact with a solid part of the bowl mimicking the curve of the bowl or surface. In step 9, you can see that it is now in contact with the wood and we can maintain contact with that all the way round without the need for a follow template. By all means, use that too or when you cannot, use the shield in the way just mentioned. Note the hand position in step 10. 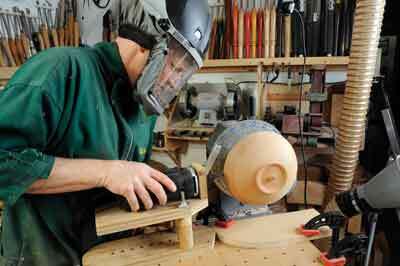 Using the router, we are maintaining pressure into the wood and the other hand is on the jig itself providing downward pressure to maintain contact at all times with the wooden router platform on the lathe. We previously mentioned the depth stops on the board. In this case, in step 11, the router was used freehand and the shield is marked with a blue line, which, when lined up with the lower marked button edge, is the stop position. In step 12, you can see that one pass with a heavy cut resulted in a not very cleanly cut groove. Also, the third groove up from the left shows where the router was not kept stable on the router bed and climbed in the cut. Ensure to maintain pressure in all the right places and take multiple light cuts.